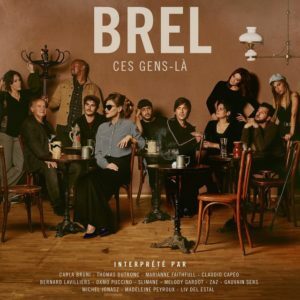 Today, April 5th sees the release on Decca Records of “Brel: Ces Gen-Là”, a special, collaborative album of songs by the late, great Jaques Brel that involved Rob and the rest of the Marianne Faithfull group as “house band” for the Parisian leg of the recording. This remarkable album, recorded in Paris towards the end of last year, was produced by top American producer Larry Klein (Joni Mitchell, Herbie Hancock, Norah Jones, Melody Gardot, Madeleine Peyroux, Jeff Goldblum) who drafted in the guys for the project after hearing their work on Marianne’s “Negative Capability” album. Indeed Marianne herself is one of the thirteen featured artists on the album, delivering “Port of Amsterdam”, the only English sung of the set, which are otherwise all delivered in the original French by mainly French or French-speaking performers. The album had long been a pet-project of Mr. Klein’s, having been a fan of Brel’s work since he was taken by his parents to see a show of his music in the 70’s , and for Rob too, it was an ambition fulfilled to work with Mr Klein, and even more of a delight to do so on this material.